Well, no, not quite. Sorry, you just aren't. Last we checked, you're not Tony Stark, and you certainly don't have the famed Iron Man Mark IV Suit from his laboratory. So, sorry to burst your bubble! We are, of course, costume purveyors, so all hope is not lost. And we've got just the thing to get you into the action. This Marvel Iron Man Morphsuit! It's decidedly way more low-tech than what those Iron Man Suits do in the movies. But that makes sense, since it's just a simple bodysuit. But it is most definitely a detailed style that makes for a great replica costume. 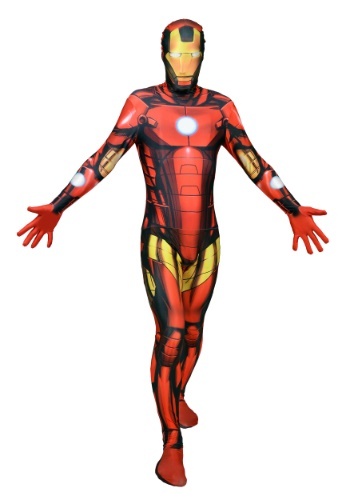 So, if you're ready to blast off like Iron Man this Halloween? Just get into this suit! This costume comes straight from Morphsuits, and it's officially licensed by Marvel Comics. It's designed as a one-piece jumpsuit, head, hands, and feet all fully enclosed, and it's made of a polyester and spandex blend for the perfect amount of stretch to get just the right fit. And, of course, it's fully printed, front and back with all of the costume details straight from the famous Iron Man suit. Unfortunately, we will include our standard disclaimer, this Morphsuit won't give you any superhero powers or abilities. But, you will look like a real deal comic book hero! In fact, the detail on this Iron Man Morphsuit is sure to have you feeling like you could blast off at any moment and fly high. Which, when it comes to costume fun, is good enough for us!